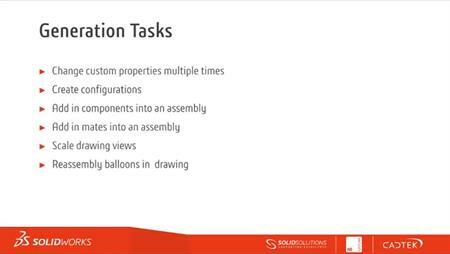 SOLIDWORKS DriveWorks Professional – Capturing and Driving Advanced Feature Properties. Advanced Feature Properties extend the ways in which the model can be driven. Using this option one can change weldment profiles, extrude end conditions and many more. This webcast shows and example of how these can be captured and driven in model rules. -Prerequisites: DriveWorks Administrator Training Course.